Lawyers for the Matlacha Civic Association are trying to convince an administrative judge to delay or block issuance of a permit for the City of Cape Coral to remove the much-maligned Chiquita lock. 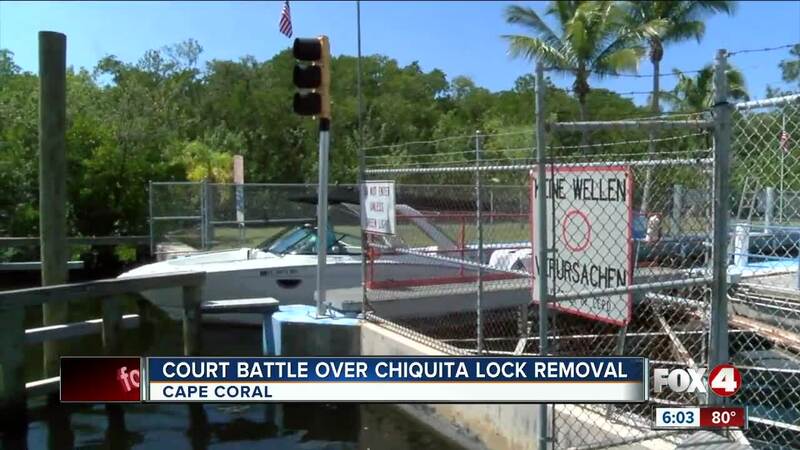 LEE COUNTY, Fla. -- Lawyers for the Matlacha Civic Association are trying to convince an administrative judge to delay or block issuance of a permit for the City of Cape Coral to remove the much-maligned Chiquita lock. "I am positive that water from the Cape Coral canals, I'm only 4 miles away, will impact my quality of life," said St .James City resident Melanie Hoff. Neighbors like her sat patiently through the hours long hearing. Hoff is one of many people concerned that runoff such as fertilizer and sediment will escape into open water if the lock is removed. “After Irma, the lock was left open for 2 weeks, nothing happened,” said Angela Bailey of Cape Coral. She is among those who wants the 50 year old lock removed. She's worried the city will have to foot the bill for legal fees incurred during this hearing. Other boaters telling us the lock has caused damage to their vessel, and long wait times to get through the lock are cramming too many boaters too close together. "You can put in a high speed lock to double and triple the amount boats that go through, so why not spend money on a high speed lock than demolish the lock and impair our waterways," said Hoff. The Matlacha Civic Association says residents were left out of the decision-making progress by Cape Coral City Council to remove the lock. The administrative hearing continues Friday at 9:00 am at the Lee County Administrative Building in Cape Coral.